Select a casing to go with your Raspberry PI. 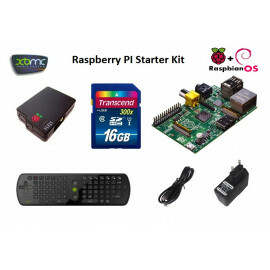 Select an Operating System to go with your PI. OpenELEC & RaspBMC are media center distributions while Raspbian, Arch & Pidora are general purpose linux distributions. Noobs Bundle is a bundle containg all these OS flavors in one package. Feature sets are customizations that you can do to a Raspbian Installation enabling the PI to be configured as a Headless server and serving a host of services. Select the SD Card size and class to host your operating system. If you want to configure the PI with any of the roles mentioned in the above section and you do not have an existing storage deives with you. You can select a storage devise here to host all you data. In case you have selected to configure the PI as a media server and you dont have enough media sources. You can select the media content bundle here. You can get the details of the options available against each bundle from the "Movies Collection" link at the bottom of the page. This way the storage and PI would come pre-installed with all the movies you selected with complete media library information and cover arts etc. Select the accessories you want with the PI. Like Power adaptors, cables, USB Adaptors, Keyboards, mouse etc. Selecting Configuration Assistance gives you one day of complete assitance in configuring the PI in your environment as per your requirement and needs. This covers the assistance in enabling the connectivity between the PI and all accessories. Initial setup and configuration. Assigning IP addresses. Configuring router for static IP assignment and MAC binding for the PI. Configuring your devices like iPhones, iPads, Android Tablets to access media residing on the PI. Configuring Airplay etc. If you have any specific requirements and needs. Please specify them here.